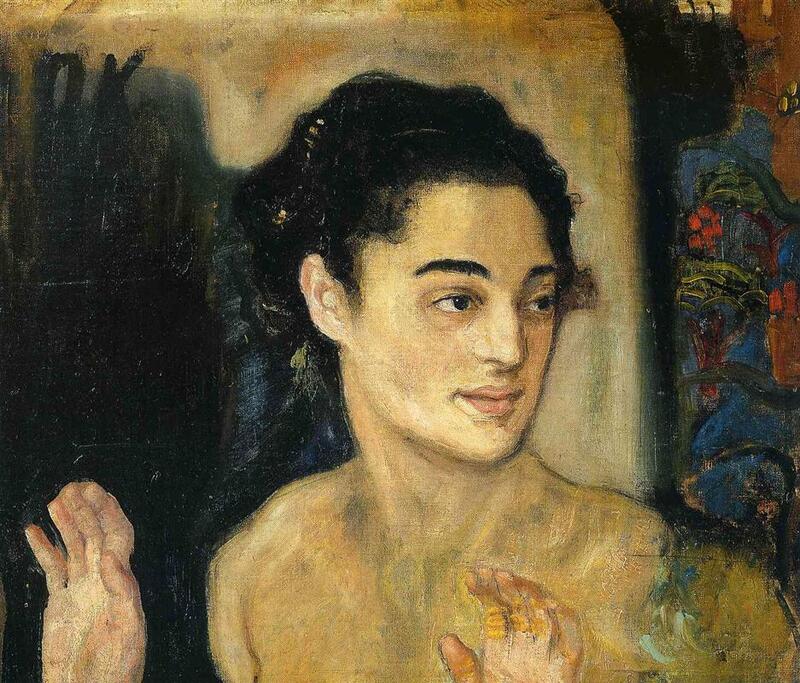 Oskar Kokoschka (1886-1980) was an Austrian painter, poet, and playwright. Born to a poor family in the town of Pöchlarn, his father was a goldsmith. 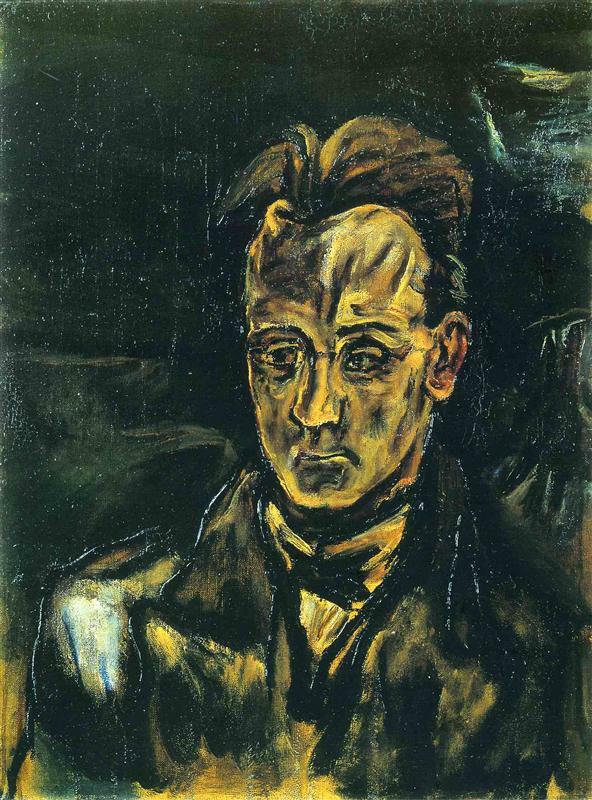 Kokoschka's early life was largely shaped by a few particular events. Shortly after his birth, a devastating fire broke out in the town, which led to a strong belief in omens and superstitions. In 1887, Oskar's older brother died, which hung over the family thereafter. FInally, his father's continual financial failure caused the family to relocate repeatedly, moving further from the center of town and into progressively smaller homes. Consequently, Oskar drew closer to his mother and took financial responsibility for the family for most of his life. He began working when he was still in school, and spent his free time, as well as some class time, reading classic literature. 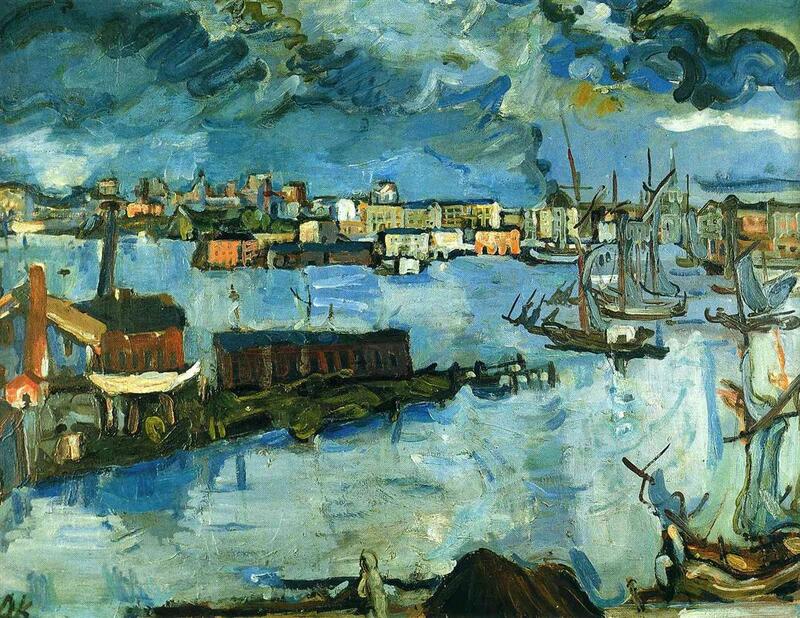 After a professor suggested he pursue a career in fine art, Kokoschka was accepted to the School of Arts and Crafts in Vienna, where he was one of three accepted out of 153 applicants. The school was very progressive, so he was able to approach painting freely, without the constraints of academicism. His early works show experimentation with a number of styles. 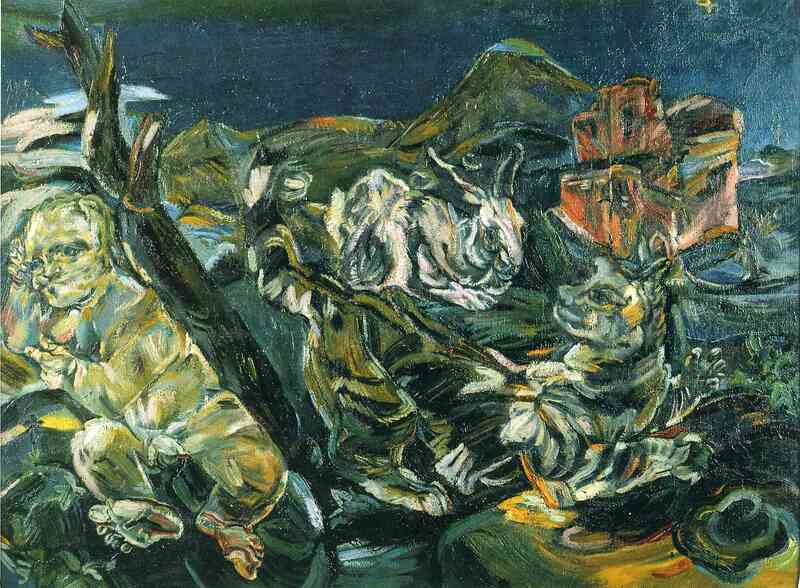 Kokoschka is best known for his expressionistic landscapes and portraits. Many of his works are very personal; perhaps his most celebrated piece is The Bride of the Wind (1914) which is an expression of his deep love for Alma Mahler, with whom he had an affair. 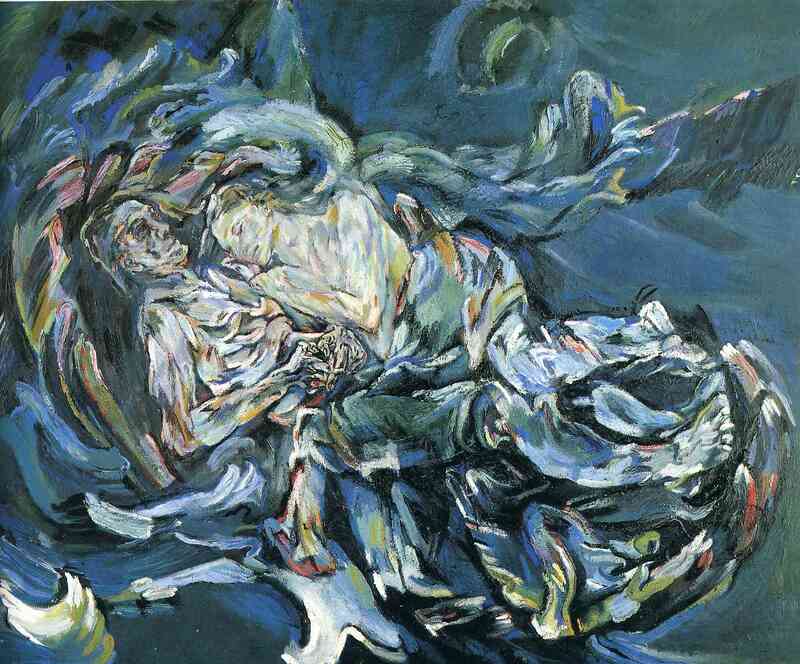 After she ended the affair for fear of becoming overwhelmed with passion, Kokoschka remained in love with her for the rest of his life. 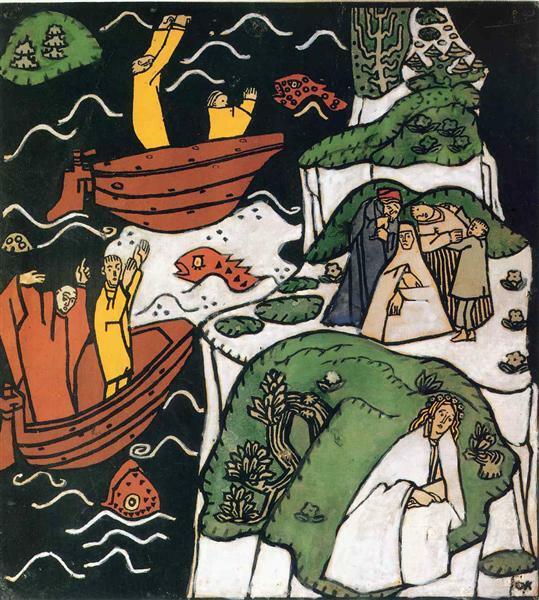 Bodégon with Affair and Rabbit is an excellent example of Kokoschka's style. Truth be told, I have no idea what the title is meant to signify, other than the obvious presence of a rabbit in the center. A bodégon is a type of Spanish still-life that shows the contents of a pantry (not really applicable), and the affair may refer to Alma again, but it is difficult to discern her presence here. What I do see is a remarkable expression of movement and flow. These curving strokes and intertwining lines seem to breathe as we view this piece. The man, rabbit, and other animal (a tiger?) are not realistically portrayed, but they have a strong presence and a certain emotional reality to them. Meanwhile, a single star gleams in the inky sky over the green mountains and plains.